Which has more effect on branch performance: demographics or management practices? The answer seems to be: It depends. Which has more effect on branch performance: demographics or management practices? The answer seems to be: It depends. When purchase of a product is driven by life events or necessity, demographics of the branch's trade area appear to influence results more than operating practices. For other discretionary products, operative practices drive results. 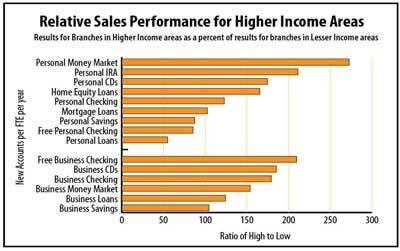 Here's a look at some of the findings from the Crowe Report on Branch Performance. Branches in higher income areas sell 2.5 times as many personal money market accounts per employee than branches located in lesser income areas. Sales per employee of personal checking and personal savings accounts are affected little by differences in household income levels. Those branches in the study that were in the top half for both household income and household density have deposits per employee of $6.6 million, which is 83% greater than those branches in the bottom half for both demographic characteristics. 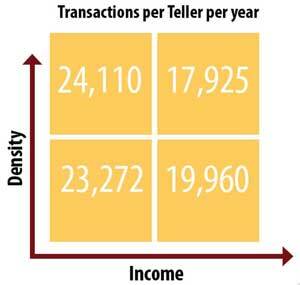 Tellers in higher income areas process significantly fewer transactions per teller per year than tellers in branches located in lesser income areas. This is likely due to a combination of customer preferences and differences in staffing strategies.